It is captioned "Want to visit Erdanse's office?" And then the video says: "Where was Erndase's office?" If I buy some writing as work for hire, can I alter it and/or put my name on it as author? Jonathan Townsend wrote: If I buy some writing as work for hire, can I alter it and/or put my name on it as author? Yes you can. What are you paying? Yet another erdnaseum clue has appeared...this time on Erdnase's hobby. Multiple clues are pointing in the same direction. "No man but a blockhead ever wrote except for money." Sam Johnson lived before Facebook and Twitter, but he still nailed it completely. Leonard Hevia wrote: "No man but a blockhead ever wrote except for money." Pete/Jonathan--Your posts reminded me of that cartoon of the guy panhandling on a city street corner. Instead of asking for money, his sign said "Need hits on my blog." One thing's for sure, Erdnase was no blockhead. A rock collector? Bill Mullins wrote: Not to interrupt the discussion of what I am sure will be a well-received issue of Genii, but . . . There is currently on ebay LINK a copy of William Hilliar's book Card Sharper Their Tricks Exposed. The front cover is _very_ similar stylistically to the front cover of the pictorial hardback Drake edition (the 1st Drake edition??). Both include silhouetted figures, and the artwork is mostly black, with spot red color. This isn't too suprising since both were contemporaneously printed by Drake, but it struck me as worth noting (especially given the speculation that Hilliar may have ghosted portions of Erdnase). Now back to your regularly scheduled anticipatory disucussion. The issue gets stitched Monday and mails Tuesday. Digital edition should be up Wednesday. Hilliar had nothing to do with Expert at the Card Table. As David Alexander mentioned way earlier in this thread, the Montana house that Wilbur Edgerton Sanders grew up in is now a B&B. Here's the link to it. It looks like two of the Erdnaseum videos were shot there. What is interesting to me about the speculation as to who Erdnase himself was is the absence of any public speculation as to who has apparently found the smoking gun. That is, is he/she one of the usual scholars (and, if so, is doing a bang up job at keeping mum) or a new kid on the block? I believe everyone interested in Erdnase is privately speculating on the who and how of the smoking gun. If it's W.E. Sanders, I imagine David Alexander may have found something in Sanders' diaries or possibly some other piece of evidence that put gambling and a deck of cards in Sanders' hands. It's possible David was planning to spring it on us at the MCA gathering in Chicago this past May. There was an Erdnase lecture at the MCA. Fate intervened and perhaps David's widow passed the papers on to Genii. I'm pondering what it would mean to find a letter describing the magic market and books of trick/mechanical how-to vs a teaching type book and how to get such a book into the market so close to the Hoffmann and Roteberg items. The article we are presenting is an original piece of work from a new author. Richard, is the Marty in the videos the author? Bob Coyne wrote: As David Alexander mentioned way earlier in this thread, the Montana house that Wilbur Edgerton Sanders grew up in is now a B&B. Here's the link to it. Bob, where are you seeing anything that indicates the Erdnaseum videos were shot there? There doesn't appear to be an ice cream parlor at the B&B nor did the web site show any piano or office photos. Excuse the partially off topic post, but your mention of the late Mr. Alexander made me remember (once again) how much wit and experience he added to this forum. Still missed. Yes, he is still missed. Frank Yuen wrote: Bob, where are you seeing anything that indicates the Erdnaseum videos were shot there? There doesn't appear to be an ice cream parlor at the B&B nor did the web site show any piano or office photos. 1) The rock collection in the erdnaseum "hobby" video is in the hallway of the house (see the guest remarks section). And here's a separate photo in flickr to it that's very clearly the same as in the video. So this one is for certain. 2) The wainscotting in the room of the erdnaseum "sing" video is of the same style as to that in rooms in the house. The B&B does have a piano (it's listed/advertised in other links for the B&B). So this one isn't certain but seems very likely to me. Bob--are you certain, or not certain? I'm beginning to wonder if the proprietors of the Sanders Bed and Breakfast keep a copy of The Expert at the Card Table in the drawer of each bedroom. Well, Vernon considered it his bible. Good catch on that Flickr photo Bob. If you look fast in the "sing" video you can also see what looks like a monogram of an S on the window of the door. It will be interesting to see the new evidence that was found that would make Richard say, "Short of a signed contract with the printer, I don't think it's going to get any tighter." Can't wait for the 10th! Will the print run of the September Genii be higher? It may be the highest selling issue ever. 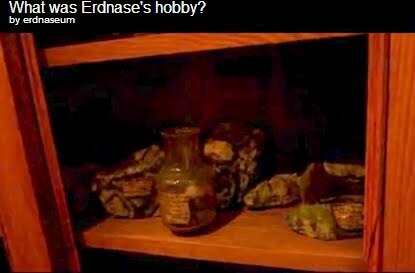 I've lightened up the rock collection frame from the "What was Erdnase's hobby" clip and as mentioned, it seems to be an exact match for the flicker photo at the Sander's house. Flicker photo taken at Sander's house. I'm guessing that is a photo of the father, not the son. Frank Yuen wrote: Good catch on that Flickr photo Bob. If you look fast in the "sing" video you can also see what looks like a monogram of an S on the window of the door. It will be interesting to see the new evidence that was found that would make Richard say, "Short of a signed contract with the printer, I don't think it's going to get any tighter." Can't wait for the 10th! I think you mean the "S" on the door window in the "hobby" video (not the "sing" one) when Marty comes in to show the rock collection. Yeah, I noticed that too...another piece that fits together. Looks just like the Image on the upcoming Genii Cover. Richard Kaufman wrote: It's not him. Wow, this is getting really interesting! hmmm...since we know the Sanders house is where Erdnase's rock collection is kept, then it's likely that Erdnase is another member of the family (other than WIlbur). He had some brothers. Interesting twists going on here! Are you saying that you used the image of Sanders on the cover as a throw off of some sort? Because when I overlay the known photo of Sanders with the Genii cover, the match is exceptionally close. I'd probably do best to wait a week or two to post this, but I'd probably forget. So pardon the interruption. HERE is a 1904 letterhead from Frederick J. Drake, who sold (or at least advertised) 1st edition copies, and published later editions, of The Expert At The Card Table. RK did not say "It's not Wilbur Sanders".